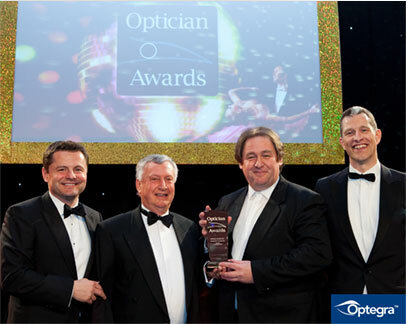 Younger Optics Europe was honored with the Lens Product of the Year award for Drivewear® lenses at the fifteenth annual Optician Awards on April 9, 2011 in Birmingham, UK. The Optician Awards is the industry’s only nationally recognized awards event, attended by MDs & CEOs from all sectors of the industry. Its purpose is to highlight the very best of the UK optical profession. The award was accepted by Julian Wiles, Younger Europe’s UK representative, who is largely responsible for increasing Drivewear’s profile in the UK lens market in recent years. “I am absolutely delighted to receive this award on behalf of Younger Europe. This means that our industry professionals recognize that the Drivewear lens is an excellent product, and that makes me proud to sell it”, says Wiles. David Rips, President and CEO of Younger Optics, says, “We are very honored to have received this award, and I am proud of everyone at Younger and at Transitions who has helped to make Drivewear a success. Drivewear fills a huge niche market – drivers – and we have gotten a lot of positive feedback from both optical professionals and consumers who have tried the Drivewear lens. The optical industry has greeted Drivewear with great enthusiasm and we are looking forward to increasing Drivewear’s popularity in Europe and Australia”. Drivewear has also received national recognition in the United States. It was the recipient of the prestigious OLA Award of Excellence in 2007 in the category of Best in Lens Materials. ABOUT THE DRIVEWEAR LENS: Drivewear lenses are specifically designed to address the unique demands of the driving task. It is the first and only polarized photochromic lens to darken behind the windshield of a car. Using Transitions® SOLFX™ technology, Drivewear lenses change colour based on current driving conditions in order to enhance the driver’s vision and provide protection from blinding glare. Drivewear lenses are currently available in hard resin in single vision, IMAGE® Progressive, FT-28 and finished plano, as well as polycarbonate single vision and IMAGE® Progressive. For more information about Younger Optics or any of Younger’s products, please call Younger Australia at 88-351-5755 or visit the company’s web site at www.youngeroptics.com. Younger Optics is headquartered in Torrance, CA, USA, and continues more than 50 years of leadership in lens innovation. Younger Optics has once again expanded the availability of their innovative line of sunlenses by introducing Drivewear® IMAGE® progressives in polycarbonate. “Without a doubt, since we released Drivewear lenses, the two biggest product requests have been for polycarbonate and for a progressive. In the past year, we’ve managed to fulfill both those requests, with Drivewear polycarbonate Single Vision and the Image lens in Hard Resin. Now, we’re bringing the two together with the new Polycarbonate Drivewear Image progressive,” said David Rips, President and CEO of Younger Optics. The award-winning IMAGE progressive has been rated favorably among recent independent studies. This is in part because IMAGE boasts one of the widest distortion free distance zones in the industry, a key advantage for the driving task. From the dashboard to the road ahead, IMAGE provides excellent viewing at near, far and intermediate distances, and can accommodate Rx ranges of -9D to +7D, with 1.00 – 3.00 add powers. And now, Drivewear progressive wearers can take advantage of the high impact resistance and higher index polycarbonate offers. Drivewear lenses uniquely combine two of the most advanced technologies found in the eyeglass industry today: Transitions™ Photochromic Technology and NuPolar® polarization. Designed specifically to meet the unique visual demands of the driving task, Drivewear Activated by Transitions® is the first polarized photochromic lens to darken behind the windshield of a car which allows Drivewear lenses to change color based on current driving conditions in order to enhance the driver’s vision. In addition, Drivewear lenses are polarized to block blinding glare, another essential attribute when driving a car. For more information and technical details, visit www.drivewearlens.com. Younger Optics is recognized as the world leader in prescription polarized lenses with its NuPolar® brand. For more information about Younger Optics, NuPolar lenses and other products, visit the company’s web site at www.youngeroptics.com, or call (800) 877-5367. Drivewear® Activated by Transitions® lenses are now available in single vision polycarbonate. “Drivewear in Polycarbonate has been the number one request since Drivewear was introduced, and we are excited to announce its release,” said David Rips, President and CEO of Younger Optics. Eyecare professionals and patients can now take advantage of the high impact resistance and higher index polycarbonate offers. Drivewear is also available in hard resin plano, single vision, Flat Top 28 bifocals and Younger’s IMAGE® progressive. Informative Owner’s Manuals that are distributed to the consumer with their purchase of Drivewear lenses are designed to thank the patient and to help them better understand the benefits and features of the product in friendly language. When patients return the included postcard to register their lenses (or register online), they receive a free gift from Younger Optics and are automatically entered into the Drivewear Sweepstakes drawings. “My Drivewear lenses are fantastic,” said Howard Geyer, grand prize winner. “I live in Florida and have used photochromic lenses before, but most of the photochromic lenses don't get dark enough in the heat of the Florida sun. That's why I love my Drivewear lenses, they get dark even when it's hot. For anyone who wants a photochromic lens, Drivewear is it." About the Drivewear Lens: Drivewear lenses uniquely combine two of the most advanced technologies found in the eyeglass industry today: NuPolar® polarization and Transitions™ Photochromic Technology. Designed specifically to meet the unique visual demands of the driving task, Drivewear is the first polarized photochromic lens to darken behind the windshield of a car which allows Drivewear lenses to change color based on current driving conditions in order to enhance the driver’s vision. The polarization properties of Drivewear lenses will block blinding glare, another essential attribute when driving a car. Younger Optics teamed up with Value Optical during the weekend of January 25 – 26 to introduce consumers to Drivewear® lenses at the Premier Cinema and Mall on the island of Trinidad. The islands of Trinidad & Tobago in the southern Caribbean together occupy approximately 5000 sq km and have over 4000 km of roadways, with over 400,000 cars on the island’s network. The event promoted eye health and safety and educated drivers of all ages about the benefits of wearing the Drivewear lens. The booth attracted crowds by displaying a Porsche Cayman sports car and models sporting Drivewear lenses in Porsche frames. Drivewear lenses uniquely combine two of the most advanced technologies found in the eyeglass industry today: Transitions™ Photochromic Technology and NuPolar® polarization. Designed specifically to meet the unique visual demands of the driving task, Drivewear is the first polarized photochromic lens to darken behind the windshield of a car which allows Drivewear lenses to change color based on current driving conditions in order to enhance the driver’s vision. In addition, Drivewear lenses are polarized to block blinding glare, another essential attribute when driving a car. Younger Optics has recently expanded the availability of their Drivewear line by adding a Flat Top 28 in hard resin. “Our Drivewear customers have been asking for a flat top since Drivewear was released, and Younger is proud to be able to meet that need,” said David Rips, President and CEO of Younger Optics. Drivewear is also currently available in hard resin plano, single vision and Younger’s IMAGE® progressive. David Rips, President and CEO of Younger Optics, points out that he has never before seen a product take off like Drivewear. “We are very honored and pleased to have received both these awards, and I am proud of everyone at Younger and at Transitions who has helped to make Drivewear a success,” said Rips. Drivewear® lenses Activated by Transitions™ is a proud sponsor of this year’s Pittsburgh Vintage Grand Prix, taking place July 7 – 15, 2007. Beginning as a one-day race in 1983, the PVGP has grown into to 10-day festival of races, car shows, a Rally and a Black-tie Gala. With more than 200,000 spectators, the Grand Prix in Schenley Park has established itself as the nation's largest vintage race event and the only one staged on city streets. The show will culminate with the 25th annual vintage races and car shows at Schenley Park on the weekend of July 14/15. As a Platinum Sponsor, Younger Optics (manufacturer of Drivewear lenses) and Transitions Optical will fit more than 250 drivers with Drivewear lenses in their prescription. Drivewear and Activated by Transitions™ logos will be featured on two pacecars as well as billboards, posters, and various other grand prix promotional items. The Pittsburgh Vintage Grand Prix’s mission is to produce a world-class vintage racing event that also raises funds to help provide residential care, treatment and support for developmentally disabled individuals in the Pittsburgh region. Drivewear and Transitions Optical representatives will be present at the Schenley Park race, July 14-15 with tents located in the golf course area and at the start/finish line. Q: Why is Drivewear so innovative? A: After years of development, Drivewear is the first polarized photochromic lens to darken behind the windshield of a car. This new lens category successfully combines two advanced technologies—Transitions. Q: What has been the reaction from patients and ECPs? A: Customers and ECPs both are very excited about this new product—not just about the lens itself, but also about the advanced technology that marries a photochromic lens with a polarized lens. Many of the older dispensers say, ‘wow, it’s about time’ and ‘we’ve been waiting for this forever. Download the unabridged article through the Drivewear website - Download page and consider the following frequently asked questions to boost your knowledge of Drivewear lenses — and how they can lead to more business for you. Since their introduction, Drivewear® lenses have been getting rave reviews – not only for the specific task of driving, but in achieving ultimate vision while in extreme, changing light conditions. Drivewear lenses did just that for Kirk Wolfinger, a two-time Emmy Award winning director and co-founder of Lone Wolf Documentary Group. Wolfinger recently traveled to Antarctica to film a documentary – Antarctica’s Icy Secrets. In order to overcome the extreme lighting conditions of Antarctica and produce the best possible documentary, Wolfinger knew he needed more than just regular sunglass lenses. He turned to David Heward, O.D., who has been Kirk’s eye doctor for more than 10 years and wears the lenses himself on a daily basis, recommended Drivewear lenses. - David Heward, O.D., Harbor View Eye Care, South Portland, Maine Throughout the trip, Wolfinger was highly satisfied with the ability of Drivewear lenses. Now that he is home from Antarctica, Wolfinger uses Drivewear lenses every day. through the Drivewear website - Download page. Nearly everyone that calls an optical shop or lab is a driver. Now you can use their time on hold to let them know how they - and their patients - can benefit from the improved vision delivered by Drivewear lenses. When callers are put on hold, they’ll hear about how Drivewear lenses are Activated by Transitions® to adjust to light and glare both outside and behind the windshield, an exciting breakthrough technology that can help make them the best driver they can be. (TORRANCE, CA — March 2007) The ever-growing line of informational and POP materials for the Drivewear® lens now includes lenticular cards – a new selling tool that Younger Optics believes will be useful to ECPs in explaining how this innovative new driving lens works. The lenticular card is about the size of a business card and made of a tough and durable plastic material. As the card is tilted forward and back, the image on the card changes so that the viewer sees how the Drivewear lens color changes in reaction to differing light conditions. The cards are perfect for display on a dispensing table and an ideal demonstrator for patients to take home with them and share with friends and family. A clear, hard plastic card holder is also available through Younger Optics. Drivewear lenses uniquely combine Transitions™ Photochromic Technology and NuPolar® polarization to create a new category of lens designed specifically to meet the unique visual demands of the driving task. Drivewear is the first polarized photochromic lens to darken behind the windshield of a car, allowing Drivewear to change from high contrast green/ yellow to copper to dark reddish brown (depending on lighting conditions) in order to enhance the driver’s vision. Drivewear lenses are also polarized to block blinding glare, which is absolutely essential when driving a car. Worldwide, there are nearly 1 billion drivers and the number is growing every year. Nearly everyone of driving age that walks into an optical shop is an ideal candidate and can benefit from the improved vision delivered by Drivewear lenses. (TORRANCE, CA — January 2007) Younger Optics has recently expanded the availability of their innovative new line by introducing Drivewear IMAGE® progressives. “Since we released Drivewear lenses, the number-one product request has been for a progressive. We are pleased to fulfill that request with the new Drivewear Image progressive,” according to David Rips, President and CEO of Younger Optics. The award-winning IMAGE progressive has been rated favorably among recent independent studies. This is in part because IMAGE boasts one of the widest distortion free distance zones in the industry, a key advantage for the driving task. From the dashboard to the road ahead, IMAGE provides excellent viewing at near, far and intermediate distances, and can accommodate Rx ranges of -8D to +6D, with 1.00 – 3.00 add powers. The TOP OPTA Competition awards one product as “best exhibit” in each of the following categories: spectacle lenses, contact lenses, frames (including sunglasses), and equipment and technologies for eye optics and ophthalmology. The competition is held in the BRNO Exhibition Centre at the OPTA International Fair, which prides itself in not just presenting the top fashion spectacle frames, glasses and contact lenses, or technology and equipment, but also in serving as a centre of education, offering numerous specialized lectures and seminars for optical professionals. The OPTA International Fair had 222 exhibitors and 19 participating countries last year. Designed specifically to meet the unique visual demands of the driving task, Drivewear is the first polarized photochromic lens to darken behind the windshield of a car, which allows Drivewear lenses to change color based on current driving conditions in order to enhance the driver’s vision. And since Drivewear lenses are Activated by Transitions™, wearers can be assured that their lenses are enhanced with superior and patented Transitions™ Photochromic Technology to automatically optimize visual performance in variable light conditions and to help protect eye health. Drivewear lenses also utilize NuPolar, the world’s leading polarized Rx technology, to provide protection from blinding glare.